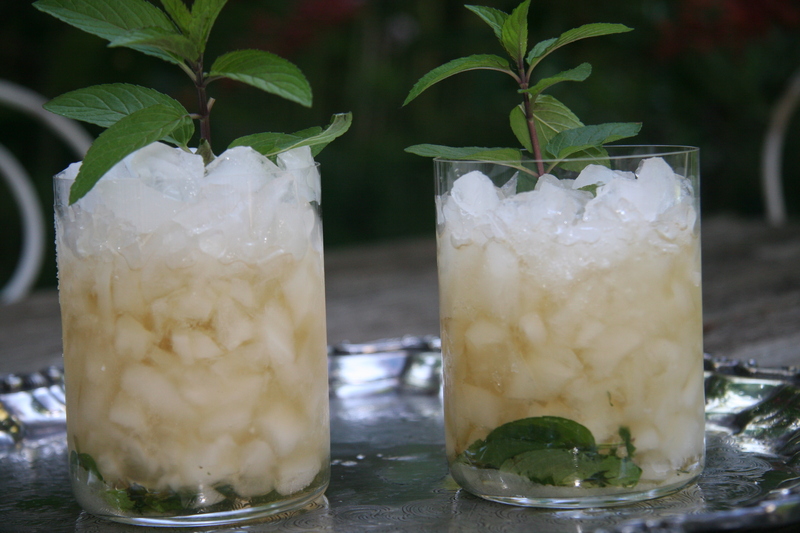 Mint julep – doesn’t the word julep make you want one? 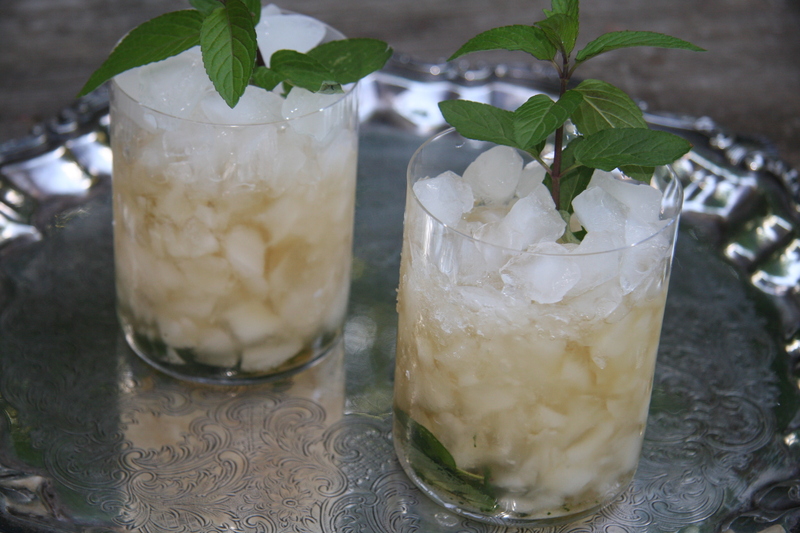 I’m not sure I’d ever heard of a mint julep until I went to my first Kentucky Derby party after moving to Dallas. 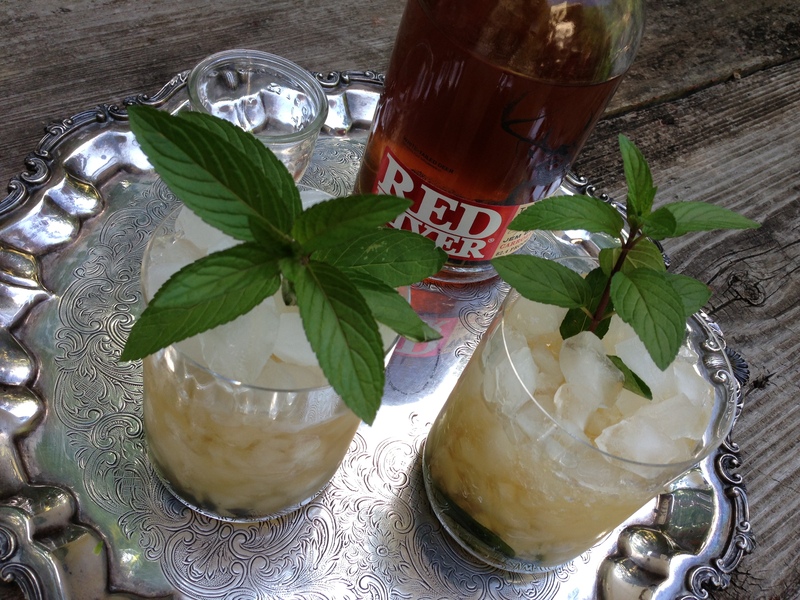 We wore big hats, bought a good quality bourbon, and took fresh mint from our garden to make the juleps. Even though I don’t prefer hard liquor – unless it’s in a fun fruity frozen drink- I was excited to try one. I thought, how bad could it be since the recipe calls for sugar and fresh mint? We made a toast to the horse we’d bet on, and as I brought the drink to my mouth, the smell made me want to run the other way. I took a sip anyway, and it was as my nose warned, awful. I mean awful. No amount of sugar or mint was going to turn bourbon into something I wanted to drink, and I was pretty sure I could have set my mouth on fire if I had wanted. The thing is, I really wanted to like mint juleps, like I really want to like Bloody Mary’s. But, I just don’t. I’m more of a bold red wine and cold beer kind of girl. Ok, enough about me, back to the mint julep. Traditionally, they’re made with a combination of bourbon, water, sugar, and mint, and the mint is typically spearmint. I grow peppermint in a large pot in our garden (it’s too invasive when planted in the ground). So, I have used peppermint instead of spearmint. The mint julep is similar to the mojito because in both drinks you muddle or mash the mint leaves at the bottom of the glass. In 1938 the mint julep became the official drink of the Kentucky Derby, but their version incorporates whiskey and not the usual bourbon. While researching the mint julep, I was curious about the difference between whiskey and bourbon, so I went to see my brother-in-law who owns Pogos Wine and Spirits here in the Highland Park area of Dallas. He says, “Bourbon and Scotch are types of whiskey.” So, whiskey is the parent category of bourbon and scotch. 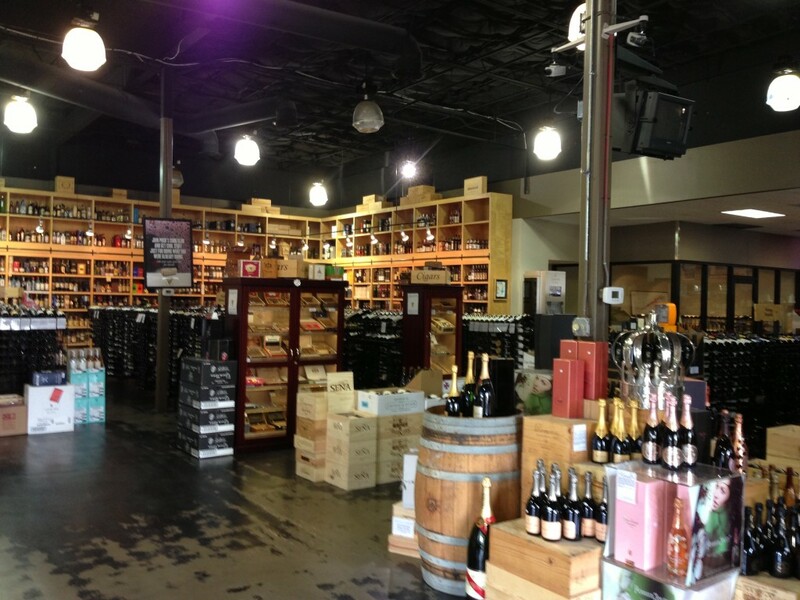 If you live near Dallas, stop by Pogos and check out their incredible selection of fine wines and champagnes – plus all the other stuff. It’s Derby Day, and people all over the South are digging out their gigantic hats, making sure they have plenty of their favorite bourbon, and getting ready to serve up some icy cold mint juleps. I think you should give this rich southern tradition a try. Cheers and good luck if you’ve placed a bet! Note: I bought Red River Bourbon, a local Texas bourbon made in Carrollton – a northern suburb of Dallas. It was mid-range in price at $31. 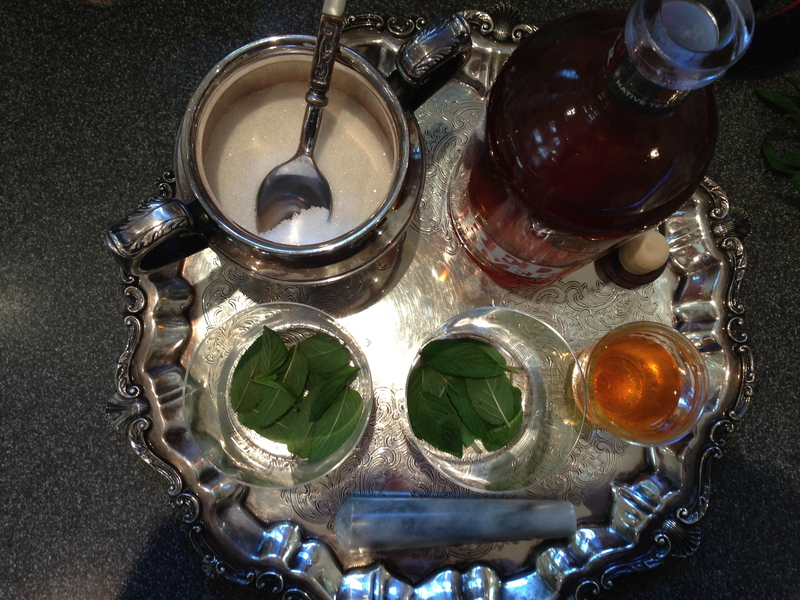 Place the mint leaves and sugar into a lowball glass. Using a pestle or other flat topped item, muddle or bruise the mint leaves. Add half of the bourbon and fill the glass with crushed ice. 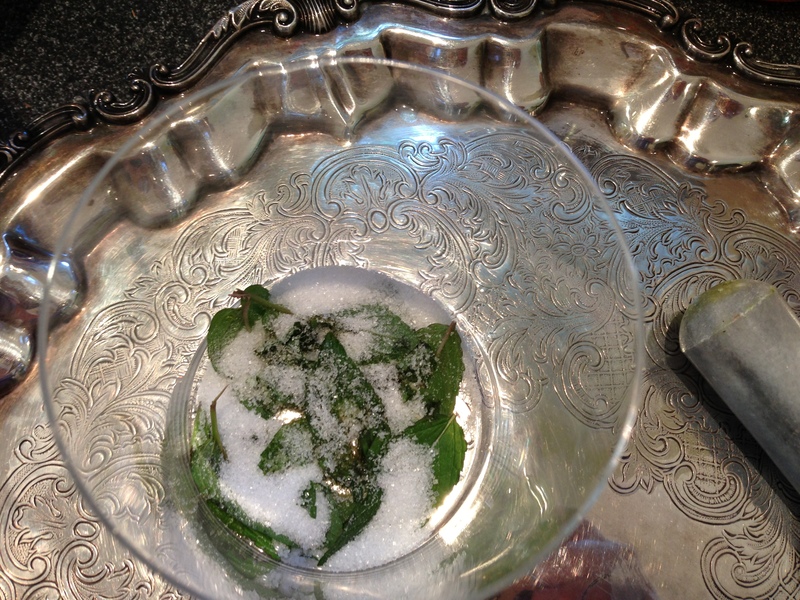 Stir to incorporate the sugar allowing the mint leaves to remain at the bottom of the glass. Add more crushed ice to fill the glass to the top and add the rest of the bourbon. Stir again and serve with a fresh sprig of mint. This entry was posted in Celebrating, Cocktails, Recipes, Uncategorized and tagged Beverages, Bourbon, Cocktails, Entertaining, Kentucky Derby, Mint, Southern Traditions. Bookmark the permalink. I never knew how to make a Mint Julep. Sounds like fun, while watching the Derby race or at a summer patio party. Thanks for a great new party idea.